This Winchester Model 11K Air Pistol review re-affirms why we sometimes just prefer the classics over the mainstream products. The Winchester Model 11K has the feel, function and fruitfulness of a classic pistol, which has undoubtedly made it a popular choice among gun enthusiasts. Made in a nickel body that contains grip plates with black checkers, this is a tough gun to crack, due to its sturdy exterior. It is capable of carrying two CO2 cartridges of 12 grams at a time and can hold a maximum of 750 Winchester BBs to shoot at any time. In terms of storage capabilities at least, this gun is mobile and compact, allowing a self-sufficient container unit. The grip feels a bit funky, but serves its purpose well enough. The trigger can be pulled and the gun will discharge without disengaging the safety hold. Besides the way that it can be connected when the hammer is not positioned, when the thumb security is connected a little catch pops out just underneath the oar. The security hold can’t be withdrawn without first untying this catch. This implies that, if this gun were to be utilized in practical deployment, it would NOT be conceivable to draw the gun from a holster and quickly sight back to the pre-set position, while raising the gun to shoot an object. This lag created between drawing the gun and actually shooting it works out as a great safety feature however, because this gun does pack some damage-inducing power for an air pistol. This gun can use .177 caliber bullets in a semi-automatic shot action, which complements a picture perfect steel barrel. Its BB clip contains 16 shots and reach a velocity of 410 fps in blowback functions. It can shoot only round BBs though, not lead pellets or other alloys. It also uses a gas cartridge which is pretty easy to refill. The purchase of this pistol comes with a kit and a case that contains loads of extra features that can be added to improve the gun. It has considerable accuracy, and the noise dampening may leave a lot to be desired. 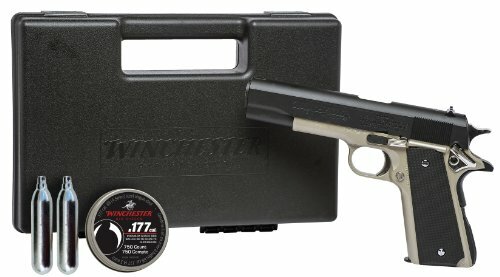 As it is made to be as real to an actual gun as possible, Winchester Model 11K is perfect for effective plinking and pest control, allowing a lot of room for target practicing in general. See our Umarex Steel Storm Air Pistol review for a full-auto alternative, otherwise the Umarex Beretta PX4 Storm Pistol will give you the kind of power you might want for practical self-defense purposes. The sight cannot be adjusted, causing a disadvantage in accuracy management. 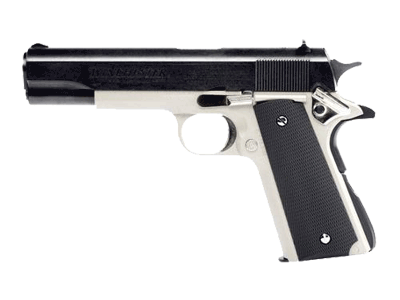 As realistic as the blowback may be, the handle feels like a toy gun, which discourages professionals from trying the pistol out. Customer reviews have always been buzzing with how amazing the Winchester Model 11K is and how the buyers consider it to be ‘the best air rifle ever’. Such big compliments would only be directed at something noteworthy, which this pistol clearly is. This particular Winchester Model 11K Air Pistol review is no different in that regard, only serving to further prove that this pistol is crafted by geniuses and made to be a substitute gun for those looking for serious self-defense guns. To that extent, this truly is the best gun to consider, especially since it is easy enough to be used by anyone of any ages. Is this a pellet and bb pistol?